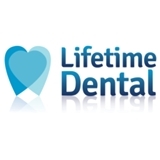 Lifetime Dental (Los Angeles) - Book Appointment Online! Lifetime Dental is conveniently located in four locations: Downtown LA, Lake Forest, Rancho Cucamonga and San Bernardino, CA. We are a multi-specialty dental practice that offers a full range of dental services, including Dental Implants, Cosmetic Dentistry, General Dentistry, Preventive Dentistry, and more. We are a family-owned general and multi-specialty dental practice, emphasizing in advanced orthodontic treatment. We accept most insurance plans, offer 0% interest financing and have our own in-house dental savings plan. New patients of all ages are welcome!